Always Playing with Paper: Merry Monday #100 & Happy Anniversary to Us! Merry Monday #100 & Happy Anniversary to Us! Happy St. Patty's Day and it is our 100th challenge over at Merry Monday! WOW! 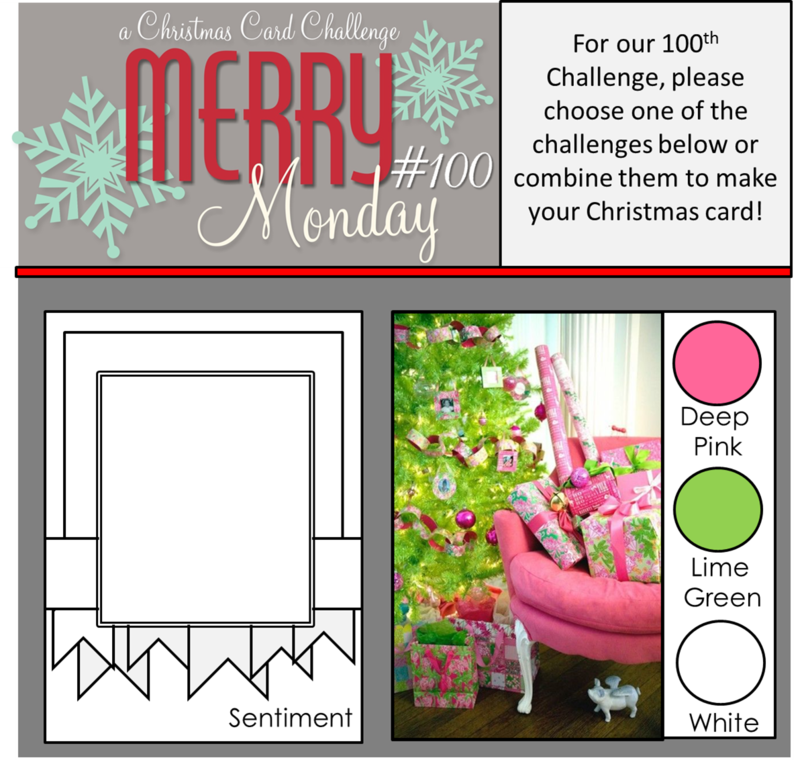 This week we are doing a special challenge where you can link up a Christmas card using Pink, Lime, White or the sketch or both! I decided to use the colours but not my sketch. 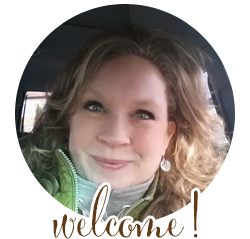 Instead I used the fun sketch over at Sugar Pea Designs. I was also intrigued by Virginia Lu's new challenge called Virginia's View and the first challenge is to use watercolouring on your card...so I got out some inks and got them wet...I like the effect! 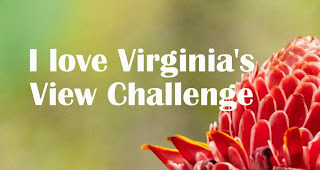 I never would have tried this without Virginia's challenge! Thanks for the nudge, Virginia!! I kept my card VERY simple and used all white to allow the poinsettia to hopefully pop! Then I stamped the sentiment onto some white paper and used my MFT banner dies to cut the sentiment out. This stamp set was in the Stampin' Up holiday mini catalogue and I loved it so much. I believe it is retired now. I used some Pretty in Pink, Cameo Coral and some Lucky Limeade and Wild Wasabi for the inks with my Aqua Painter. The colours kind of bled into each other but I actually enjoyed the look they created. It was really fun...you should try this technique. I tried photographing my card differently using some natural light...what do you think? I am happy with how much truer the colours are showing! One day I will get better at taking photos of my cards!! awwww....happy anniversary! You guys are so cute together and I LOVE that picture! your card is gorgeous...LOVE the coloring! Happy Anniversary Lesley!! Love your card, the watercolour look to it! This is beautiful, Lesley! Happy Anniversary! Love this card! And happy anniversary! Happy Anniversary...what a beautiful picture of the two of you! And congrats on your 100th MM!! Beautifully watercolored bloom Lesley, this is wonderful! Happy Anniversary to you and hubby Corey! Happy Anniversary Lesley! xoxo Beautiful photo. Love your card for the 100th challenge. Lovely watercolouring! Happy Anniversary, Lesley!! 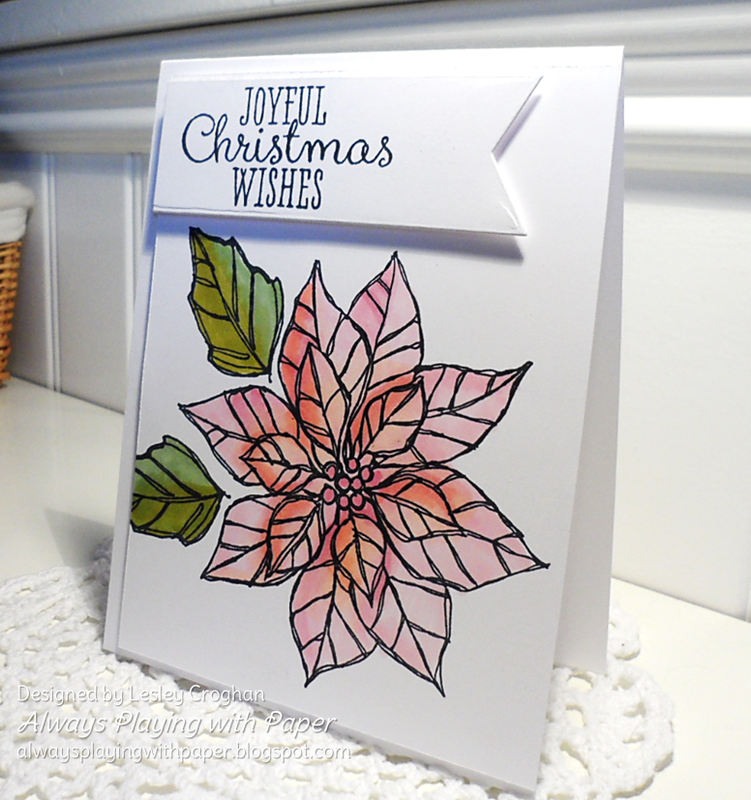 Very pretty watercolored poinsettia! Love the CAS layout! Happiest congratulations to you and your husband! Love all you do, Lesley! Happy Anniversary! Love your beautiful photo.......such joy! Lovely card too! Happy Anniversary! And you've created a BEAUTIFUL card as well...I love that you used lighter shades of these colors!! What? Your first time watercoloring? Are you sure.....lol... This is just beautiful, I love watercoloring, but sometimes it's hard to relinquish a bit of "control" and just see what comes out (at least for me!) Congrats on 100 challenges at MM, what a milestone! And Happy Anniversary :) Have a lovely St. Pat's! happy anniversary! love your awesome card, Lesley! What a gorgeous card, Lesley, and Happy Anniversary to you and your hubby! Wow, Happy Anniversary to you and your hubby. Congrats on the 100th challenge at Merry Monday, and Happy St. Patty's day to you. Love your pretty card with the watercoloring. Great job. Your card is absolutely beautiful! Great job with the watercoloring!!! Happy Anniversary to you and your hubby & Happy St. Patrick's Day to you!!! Congrats for both anniversaries, Lesley and many more to come! Love your card; the white does make the poinsettia really pop. You have watercolored this poinsettia beautifully, Lesley! I love the banner sentiment that fits perfectly! Happy anniversary! I hope you celebrate in style! Happy Anniversary to you & your husband as well as the challenge. Your card is beautiful. Love how the pointsettia turned out with the water colors. Well you and your hubby are both just adorable!! It's that simple :) I hope you have a wonderful anniversary! Your card is stunning! The watercolor is just beautiful! LOVE your card and fabulous coloring! Happy Anniversary - here's to many, many more wonderful years together! Happy Anniversary to you both Lesley! You both look so happy and adorable! Congrats on 100th challenge. Your card is so elegant and beautiful. I have my card made and ready to go already..can't post it until late tomorrow. Beautiful card Lesley, lovely water colouring. Congratulations on the 100th post for MM, Happy St. Pat's Day and Happy Anniversary to you both! Great photo....Happy Anniversary...your a beautiful couple! Congrats on the 100th post....I wish I had more time to play along on all your wonderful challenge sites...but i guess I have to sleep too. Hope you week slows down! Love the colors this week! Happy Belated Anniversary Lesley and Corey :). Your card is beautiful, this poinsettia is gorgeous. What a great card - love your clean fresh take on our sketch! Thx for joining us at SPD and hope to see you again! Such a nice clean and simple card for this challenge. I like that even though you went for the color combo and not the sketch you got a flag banner in there! Well, Lesley, happy anniversary! And Happy St. Patrick's Day! And good for you, playing along with Virginia's new challenge and trying something a little different...your card is absolutely beautiful! That big poinsettia image is just begging to be painted...your watercoloring is fabulous! A real milestone--Happy 7th anniversary, Lesley! 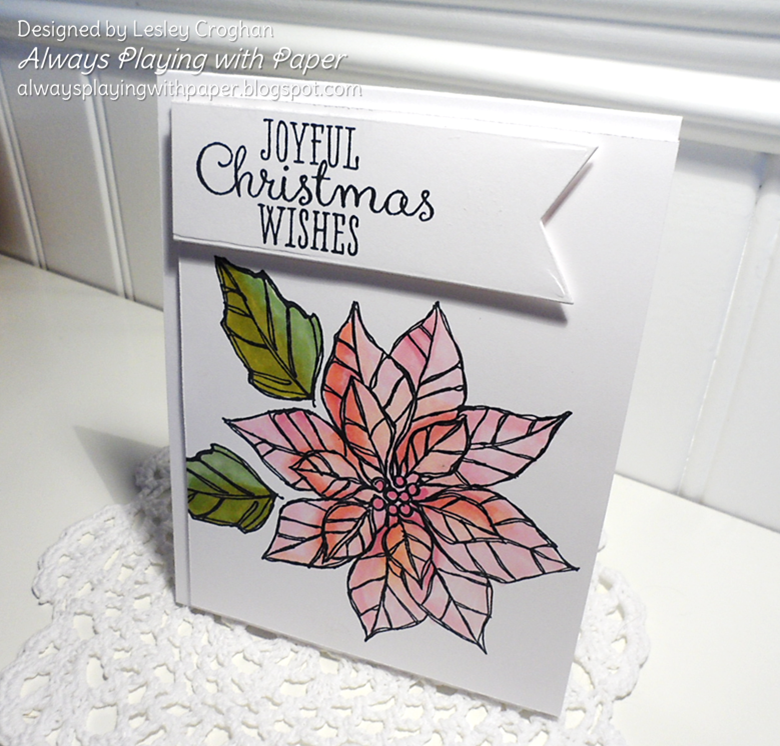 Your card is just stunning--perfect design for that gorgeous poinsettia! What a gorgeous card, Lesley! I've seen this stamp used many different ways, but what you've done with it on this card is my absolute favorite! So simple, yet so beautiful! Congrats too on your recent anniversary! What a beautiful picture of the two of you! Such a beautiful card, Lesley!! Happy Anniversary to you both - wishing you a lifetime of happiness together!! Purple Onion Designs Giveaway ALERT!!! SRM Stickers Design Team Project Peek! Paper Sweeties March Release Rewind! March 15: Paper Sweeties March Release Party! Paper Sweeties March Release Countdown! Paper Sweeties March Release Sneak Peeks!